Behold, my deep and inefficient pantry cabinet. When it comes to reselling your home, make your pantry look like a grocer's shelves or the appliance section of Williams-Sonoma. Take away the jumble of everyday cooking. Present an idealized version of your space. Let the buyer know there is abundant room for all her wedding gifts. If only she had this kitchen, all her canned goods would stack magically in neat rows of descending size. Seriously! Oh, I know...your kitchen cabinets don't store all that much--neither do mine. You just have to make them look that way by removing excess clutter. Face all the labels to the front. Condense bulk grains and small items in storage boxes or Tupperware. Re-line your shelves if necessary. Wipe the dust and splatters from each appliance. Box your madeleine pans and tart shells in the attic for now. The closer you get to putting your home on the market, the fewer groceries you should restock. Eat through your stockpile--you don't want to move all that food, anyway! Disclaimer: While some of the super homemakers may keep their pantries picture-perfect, this advice is for the rest of us! This is one time when it truly pays to be organized. I also have done the "pantry thing." I never felt so organized in my life, and I frequently opened the door just to gaze at the wonderful display!!! I redid all my closets, etc., like that and had a buyer within 2 weeks. Please continue with the pictures. We LOVE them. LOVE the pictures. 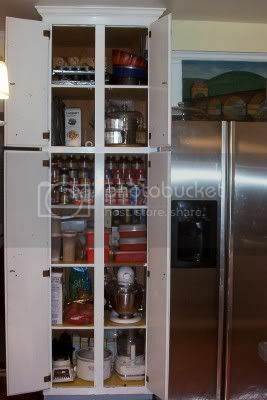 My pantry looks like that, but only because I just moved to a new place! So, if you're doing all this organizing work right now, does that mean you've decided to go ahead and sell in April? Please keep the before & after pics coming! They are great. I never gave it much thought but maybe part of the reason our house sold in 3 days was that the kitchen cabinets were very uncluttered as we had just finished remodeling six months prior and I hadn't had time to clutter them up yet. Wow - I keep waiting for the declutter fairies to come and visit my kitchen cabinets. So far they have skipped me. Great pics!